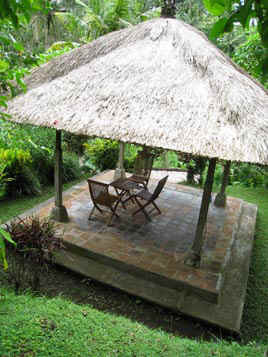 "An amazing, private, and quiet villa hidden near most of the bustle of Ubud. Clean and well-loved, there is space for many, air conditioning in the bedrooms, and a unipue layout that offers an amazing view of nature and a peaceful place to rest after long day out. The hospitality is top-notch! Don't forget to leave note of your own in their house book - this place has been around a long time and visitor from years past have left many good tips as well! Worth the stay - we already miss it! Don't pass up the opportunity to stay in a true balinese-style home with a gorgeous surrounding of plants and life in a quite, private, and gorgeous villa. The pool is chlorinated and they offer many other amenities!" "Dr. Michael, I wanted to extend my thanks for the amazing week in rumah kartka dharma. The villa is everything that we had imagined and more - Made Suardi is a great guy and an amazing caretaker. I took a bit of a spill on the way down the path the first time due to some wet moss - he had medicine at the ready and helped us out. The villa is a great place to relax after a long day out and is really a one of a kind experience. we just moved into our new hotel and we already miss it! we left a note of our own to add to the book as well, and a couple flashlights and pool toys for the next visitors. If we are ever in bali again, we are definitely going to reach out! We live near boston, so if you are ever in town feel free to reach out - we would love to extend the same hospitality that we received! You can find us on facebook easily. - Chris Goff and Joshua Castle, from Natick, MA. Thanks again and good luck!" "We absolutely LOVED our time at Michaels beautiful home. The house was absolutely perfect. It is in a wonderful location, easy access to cafes and stores if needed but also isolated enough (just a short walk down a pathway) so that it was tranquil and peaceful. No sounds of traffic, only the peaceful sounds of waterfalls and nature. The view was spectacular, we found ourselves not wanting to leave to face civilisation. Waking up to the jungle views was sublime, magical. This place is like a lost piece of paradise. Could not recommend this place enough!!" I'm writing a belated thank you for our wonderful holiday. Getting back to work deluged us and we forgot to let you know how we went. Made and Katut were just wonderful and anticipated every need. Such a restorative break ! and we still talk of it very fondly. A lucky find ! we hope to be back ! Just wanted to let you know how much we enjoyed our stay at Rumah Kartika Dharma. Both Made and Ketuk were great help and pampered us all. Ketuk made us breakfast every day and a few memorable dinners. She is indeed a great cook. After a full day of sightseeing we were glad to return to the comfort of the villa and the attentive staff. The grounds of the villa and the villa itself are well kept. 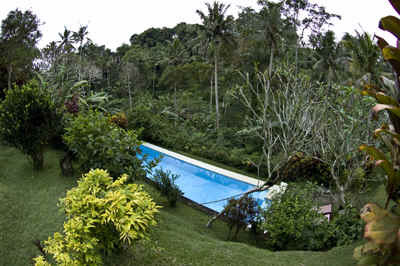 The view of the natural forest, waterfall and rice field from across of the villa is absolutely breathtaking. We definitely will recommend your villa to our friends. Thank you very much for allowing us to stay at your villa. We loved our experience in Bali, your home being the center of our life there. We felt very comfortable and relaxed sitting on the corridor and looking at that unforgettable view. Pak gave us a massage every other day and Ketut was willing to bring home big papayas for juice. We walked a lot and celebrated their holiday by joining the villages in Penestanan for the waving procession. We would love to go back. Madé was helpful and gentle, great company during our long drives. We thank you for the delightful opportunity to stay in your home. Rhumah Kartika Dharma is magical! My wife and I really enjoyed our stay there....Madé and his family made us feel comfortable right from the beginning. In addition to tasty breakfasts, Ketut fixed delicious and memorable dinners for us and friends. Thanks for letting us stay at your Balanese home. We hope to be able to return soon! ...our stay at Rhumah Kartika Dharma was all that we expected and more...the pool is delightful, refreshing and private... Pak's smilling face, gamelan playing, and all around good vibes warmed us daily; our hikes provided extra and unexpected discoveries. We were treated like royalty. We'll be back! Just wanted to touch base as our three weeks in your lovely house come to a close to say how much we have enjoyed our time here. The house is simple and comfortable but much of the credit for happiness goes to Made and Katut and Made's father who is quiet but a peaceful and loving presence. Made is around in a very non-obstrusive way and is always helpful and positive. He makes the house beautiful every morning with flowers and offerings and is just a delight to have around. Katut is only present for meals but is a wonderful cook and a joyful spirit. The house is kept in pristine condition and the pool sparkles. We have been very happy and peaceful here. The internet connection via Telkomsel Flash has been just great. I thought I would take this opportunity right at the beginning of the New Year to thank you for the wonderful stay our family had at Kartika Dharma. The house and grounds were everything we had hoped for, and with Jen and I being only 150 metres away it all worked very well. 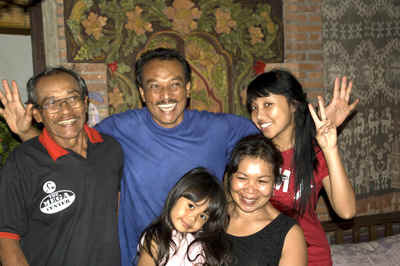 Our entire family wanted me to express to you how marvelous Made and Ketut are. Their friendliness, openness, honesty, good humour and respectfulness was always obvious. We thoroughly enjoyed their presence in our family. In fact, we had Ketut, Pak, Made, Kadek and Nalani [wrong spelling I'm sure] with us at the Christmas dinner, which was a real honour and privilege. Nalani and Kadek danced for us and delighted in watching the video replay later. What a beautiful Indonesian family. Ketut's warm, smiling welcome each morning got us all off to a great day. And the cooking! We were just SO well looked after in the food department. We had one evening meal before Christmas and then the Christmas feast. So much food and every morsel tasty and succulent. And Pak - what a character. He toodled around each day making sure the grounds were spot on. the way he zoomed up those slopes was amazing. We even got to meet the land owners on the last day; so we've met everyone except you; even though we feel we know you as a result of all the people who spoke of you in and around Ubud! Michael, we sincerely hope this is not the first and last visit to your Bali home. We had a wonderful family time together which we will remember for all time. Thank you. Danny, Jenny, Patrick, Andrew, Chris, Elise and Siboney. Traveling around the island the first week was the perfect way to quietly soak in the culture and pure beauty of Bali. The locals we met along our path touched my heart forever. The smiles... the pure genuine nature that bombards an "aware" foreigner's senses on a daily. The paintings! Every glance was a snapshot in my memory... filled my creative tank with juices that have not yet inhabited such spaces. My mind was in a constant creative pursuit. After moving around for 7 days, your home was a much needed settlement. The beauty! No way I could have been warned of such... . your house is truly special. The energy, the architectural layout and open space, the location it sits beside. Heaven. I miss it already... all of it. We wanted to let you know that we REALLY enjoyed our time at Rhumah Kartika Dharma, the two weeks we spent there passed too quickly. The house was perfect for us, spacious and comfortable with entertainment at the door provided by the geckos, chickens and squirrels all in the lush green setting of the garden. The pool was a great oasis for us in the hot afternoons, it's so large, clean and cool. The house is located close enough to Ubud to enjoy the cafes and warungs and do some shopping but far enough away that that the noise and heat of town are quickly forgotten. We especially loved walking in the paddy fields where we found the cool breeze that blows across these open areas a relief. Made, Pak and especially Ketut took great care of us. Ketut's cooking is truly superb. One of the things we love about visiting Bali is the food and Ketut certainly indulged us. Made keeps the house spotless and does many of the unseen chores while Pak tends the garden with love. They all contributed to making our holiday a peaceful and relaxing one. The driver Made arranged for us was great, his English is good, he is very prompt, patient and a safe driver. Best of all he doesn't take you to shops you don't want to go to. We have some friends that have expressed an interest in visiting Bali and will pass on the link to your web site to them with a recommendation. Ubud is a great alternative to the big city feel of the Kuta area, we are very glad we chose as we did. We thank you for establishing such a great place. During our internet searches for accommodation none provided the peace, privacy and services that your house does. We hope that next time we visit Bali we will find your house available.